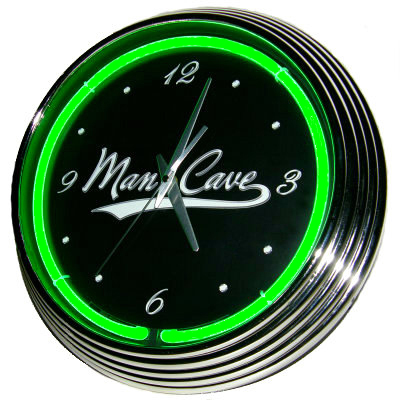 This stylish Man Cave Neon Clock - Green was designed specifically to enhance the masculine decor of any Man Cave, garage, office, bar or other favorite room. A man cave neon wall clock is ideal for any special occasions such as a birthday, anniversary, Christmas, holidays or a retirement. ON CLEARANCE A MAN CAVE GIFTS Exclusive Design. © Copyright 2013 .